AGENCY: Community Living Assistance Services and Supports (CLASS) Office, Department of Health and Human Services. Authority: The Personal Care Attendants Workforce Advisory Panel is authorized under section 8002 of the Affordable Care Act, Pub. L. 111-148. The Committee is governed by provisions of Pub. L. 92-463, as amended, (5 U.S.C. App. 2), which sets forth standards for the formation and use of advisory committees. SUMMARY: The U.S. Department of Health and Human Services announces establishment of the Personal Care Attendants Workforce Advisory Panel, as directed by section 8002 of Public Law 111-148. FOR FURTHER INFORMATION CONTACT: Margaret Reiser, Department of Health and Human Services; Telephone (202) 690-7858, Fax (202) 690-7383. 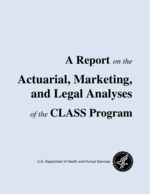 SUPPLEMENTARY INFORMATION: Under the Affordable Care Act, Public Law 111-148, the President directed that the Committee shall be established within the Department of Health and Human Services (HHS). To comply with the authorizing directive and guidelines under the Federal Advisory Committee Act (FACA), a charter has been filed with the Committee Management Secretariat in the General Services Administration (GSA), the appropriate committees in the Senate and U.S. House of Representatives, and the Library of Congress to establish the Commission as a non-discretionary Federal advisory committee. The Secretary signed the charter on June 4, 2010. The charter was filed on June 7, 2010. Objectives and Scope of Activities. The Personal Care Attendants Workforce Advisory Panel is the Department's statutory public advisory body on personal care attendant workforce issues related to the Community Living Assistance Services and Supports (CLASS) Act in the Affordable Care Act. With sensitivity to policy considerations and priorities, the Committee will provide advice and guidance on issues related to the adequacy of the number of personal care attendant workers, the salaries, wages, and benefits, and access to the services provided by personal care attendant workers. The Committee shall assist and advise the Department on personal care attendant workforce policy as it pertains to the Department, States, local governments and the private sector. Membership and Designation. The Secretary is soliciting nominations for appointment to the 15-member Advisory Panel from among members of the general public who are individuals who have distinguished themselves in the fields of long-term services and supports; aging and disability populations and services; practices that help reduce high personal care attendant workforce vacancy and turnover rates; Medicaid, Medicare, the Older Americans Act and the Workforce Investment System; community residential services; and policy analysis and development related to the financing, access, provision and quality of health care services. Each member of the Advisory Panel shall be appointed for a term of 2 years. Nominations shall be submitted to Margaret Reiser, U.S. Department of Health and Human Services, Office of the Assistant Secretary for Planning and Evaluation, 200 Independence Avenue, SW., Room 415F, Washington, DC, 20201 no later than June 18, 2010. Any vacancy on the Advisory Panel shall not affect its powers, but shall be filled in the same manner as the original appointment was made. An individual chosen to fill a vacancy shall be appointed for the unexpired term of the member replaced. A Chair will be designated from among its members. Members who are selected from the Federal sector to fill positions on the Committee will be classified as regular government employees. The Committee members who are selected from the public and/or private sector will be classified as special government employees. Administrative Management and Support. HHS will provide funding and administrative support for the Committee to the extent permitted by law within existing appropriations. Staff will be assigned to a program office established to support the activities of the Committee. Management and oversight for support services provided to the Committee will be the responsibility of the CLASS Office. All executive departments and agencies and all entities within the Executive Office of the President shall provide information and assistance to the Committee as the Chair may request for purposes of carrying out the Committee's functions, to the extent permitted by law. A copy of the Commission charter can be obtained from the designated contacts or by accessing the FACA database that is maintained by the GSA Committee Management Secretariat. The Web site for the FACA database is http://fido.gov/facadatabase/. Acting Assistant Secretary for Planning and Evaluation.